Showing 51 articles from October 30, 2013. LOUISBURG — Investigators and prosecutors upped the charges against a Warrenton man accused of killing a woman and critically injuring her husband in an alcohol-related fatality. Kenneth Edward Nichols, 50, was initially charged with felony death by motor vehicle, felony hit and run, careless and reckless driving, and driving while impaired following the wreck on Bickett Boulevard the afternoon of Oct. 26 that claimed the life of Cora Green, 80. Quiet election to equal big changes? FRANKLIN COUNTY — Town voters will have a chance on Tuesday to elect leaders in a number of contested races that will shape their communities into the future. Youngsville, Franklinton and Louisburg all have contested races on either their governing boards, for the mayor’s seat, or both. YOU DON’T SCARE ME. 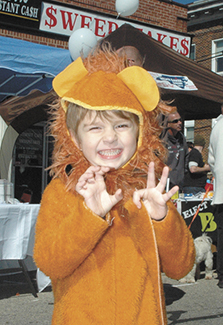 Josiah Jacobs roars in his costume Saturday while walking around Frankenfest on Main, a street festival in downtown Franklinton. Halloween activities will take place on Halloween night all around Franklin County, with particular activities in each of the towns. More pictures from Frankenfest in the 'Community News' section. LOUISBURG — Elbow to elbow, commissioners and school board members sat around a square table, ready to hear about the current condition of the school system. 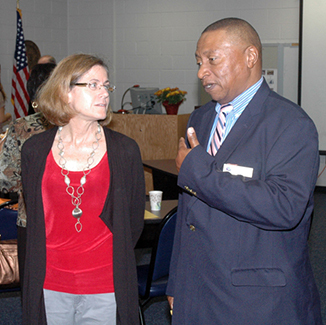 Interim Superintendent Randy Bridges didn’t have any grand plans to reveal. But that wasn’t the point of the joint breakfast meeting on Wednesday morning. WHITE LEVEL — Looking back over three decades of success and growth while keeping focused on tomorrow is no simple task, but that’s what happened Sunday afternoon. 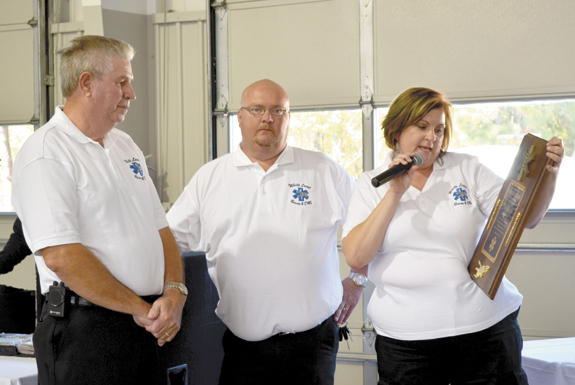 The White Level Rescue and EMS held an afternoon ceremony to reflect on 30 years of service to Franklin County — and kept part of the focus on continuing to improve in the future. Being officially old comes with new duties! One little guy who I haven’t even formally met just yet has done what increasingly grey hair and complaining joints have failed to accomplish, he made me feel old. The stork, which had been circling our family for quite some time, finally made its final approach on Sunday and delivered a six pound, 11 ounce baby boy that makes me a grandfather — and officially old! Of course, I’ve been unofficially old for a long time, although most folks would call that denial! White Level Rescue, EMS marks 30 years! A small, low-key ceremony in the White Level community on Sunday afternoon probably meant different things to different people. But, to all, it should underscore the fact that we live in a very special community among neighbors — some at least — who care and put the needs of others ahead of their own. The ceremony marked the 30th anniversary celebration of the White Level Rescue and EMS Service. There are many things that are troublesome right now in this great country of ours. The rollout of Affordable Health Care Act has gone less than stellar. To thwart it, political leaders partially shut down the government, forcing many folks out of work, costing the country millions and endangering our credit rating. Radical thinking: States’ rights or states’ wrongs? A dangerous threat to the liberty and freedom for future generations is that they are successfully indoctrinated to believe the views of our founders on government by “we the people” were flawed. At different times in our history, the political winds favor one group over another. The favored group always points to injustice to pass laws to gain advantage. ‘Interesting’ hiring practices; just a return on investment? In an earlier column I covered the interesting hiring practices at DHHS aimed at taking care of de jure Governor Pat McCrory’s campaign infrastructure. Today I’d like to look at some other creative spending at the agency under McCrory and DHHS Secretary Aldona Wos. As previously disclosed, managed care industry veteran Bob Atlas is onboard as a $250-per-hour consultant. LOUISBURG - Funeral services for Cora Virginia Green, 80, who died Saturday, Oct. 26, 2013, will be held Friday, Nov. 1, at 2 p.m. at Roland Chapel Christian Church, with Minister Annie Davis officiating. Burial will follow in the church cemetery. LOUISBURG - Funeral services for Gwendolyn Steed Keith DeVault, 97, who died Wednesday, Oct. 16, 2013, were held Tuesday, Oct. 22, at South Main Street Baptist Church, with the Rev. David Rosby officiating. Burial followed in the Perry’s Missionary Baptist Church cemetery. LOUISBURG - Joseph E. “Joe” Smith, 90, died Monday, Oct. 28, 2013. SHOESTRING TACKLE. 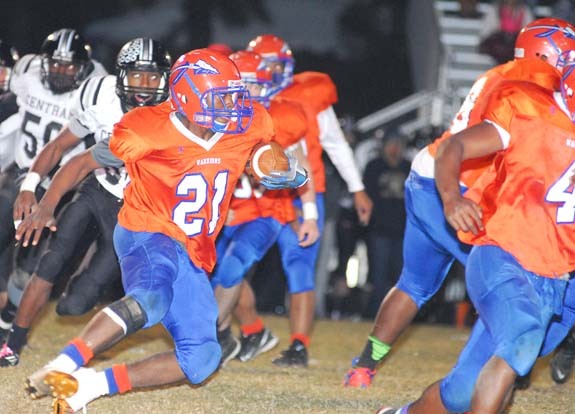 Nassau Community College running back Travis Lock (left) tries to hang on to the ball while being tackled during last Saturday’s road victory over Louisburg College at the Franklinton Middle School Football Field. 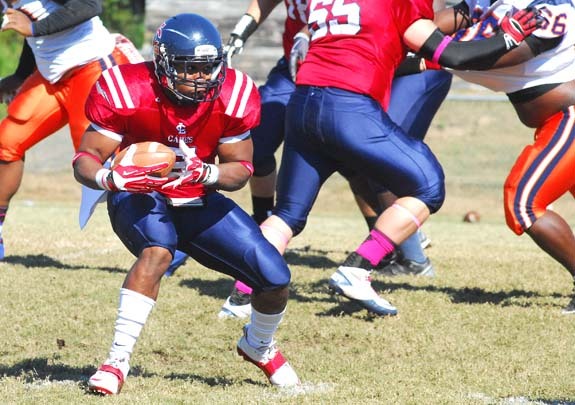 LOUISBURG - Just four weeks ago, Louisburg College was 5-0 on the football gridiron and ranked in the Top 20 nationally. LC was coming off one of the biggest victories in school history -- a road win at perennial power Dean College -- and Coach John Sala felt his team was well-equipped to make a run at one of the top spots in the competitive Northeast Conference. BALL HAWKS. 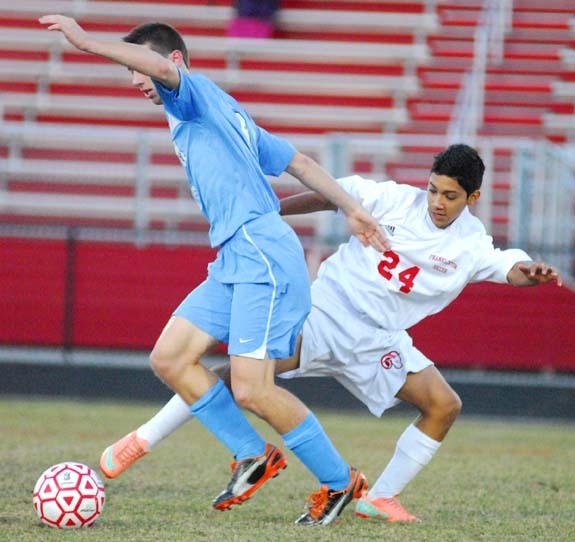 (L to R) Franklinton’s Josh Ortiz and North Carolina School of Science and Math’s Cameron Pharr attempt to chase down the ball during last Wednesday evening’s prep boys soccer matchup. 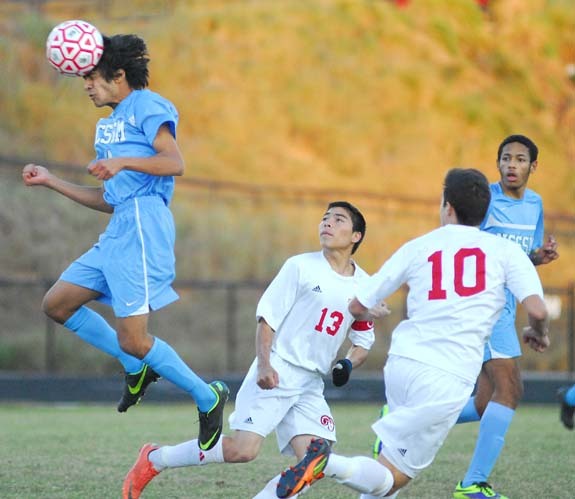 FRANKLINTON -- Coach Isaac Welker couldn’t have asked for a better scenario for his Franklinton High School boys soccer squad to close out its regular season schedule. Following a long winning streak and accompanying climb up the Northern Carolina Conference standings, the Red Rams had a chance to win the league championship last Wednesday during a home match with North Carolina School of Science and Math. 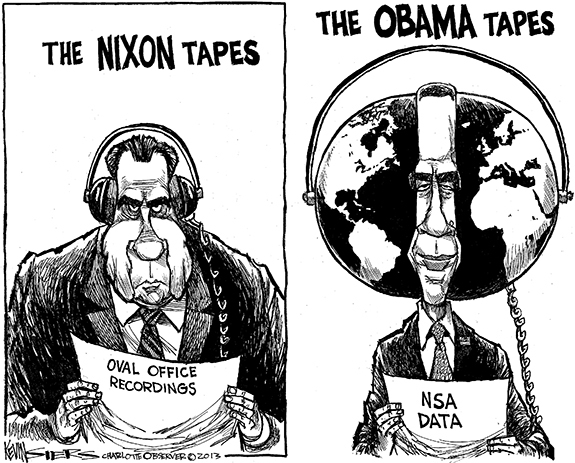 CONVERGENCE. 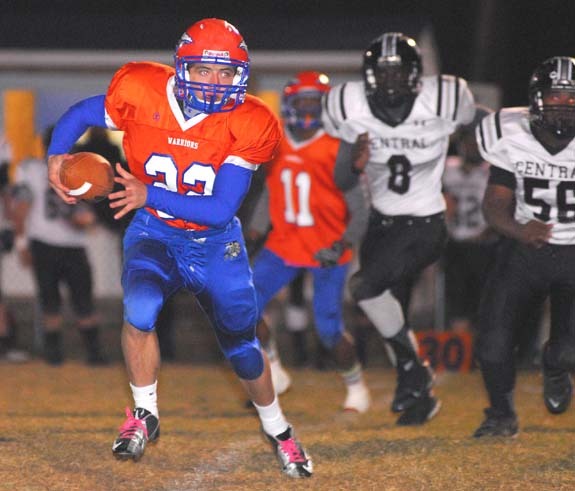 Franklinton defenders Mike Waverly (left) and Jackson Hooton (center) try to chase down a Roanoke Rapids’ running back. ROANOKE RAPIDS -- Franklinton has shown a penchant for being able to win close games during Jeremy Buck’s two-year stint as head coach. 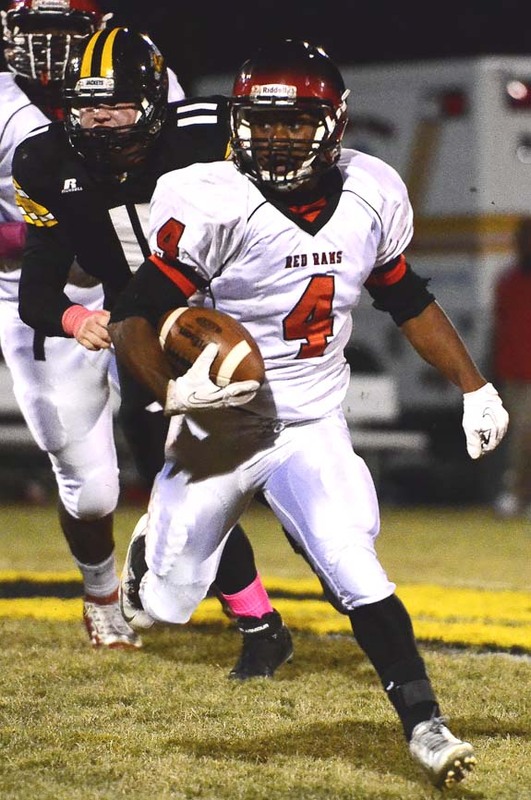 The Red Rams added to that clutch total last Friday with a 19-15 comeback victory at Roanoke Rapids in an important Northern Carolina Conference football showdown. PARKER POUNDS ONE. Bunn’s Parker Brantley (right) delivers a kill last Thursday evening against Southern Vance in the Class 2-A State Playoffs. BUNN -- Even though a volleyball match is the best-of-five games, the winner of last Thursday’s opening game between Bunn and homestanding Southern Vance was destined to be the eventual victor. That team would prove to be Southern Vance, which claimed a wild first game and went on to defeat the Ladycats in the third round of the Class 2-AA State Volleyball Playoffs at the SVHS Gymnasium. FOLLOW THE BLOCKERS. Louisburg High School’s Derrick Smith (21) finds a seam during last Friday night’s home triumph against conference rival Granville Central. LOUISBURG -- It’s not a given that the winner of last Friday’s Tar-Roanoke Athletic Conference football grudge match between Granville Central and Louisburg will ultimately claim the league championship. But it’s almost a certainty that the loser will fall out of the title race, barring an unexpected turn of events heading into the final two weeks of the regular season. ALL ABOUT EXCELLENCE. 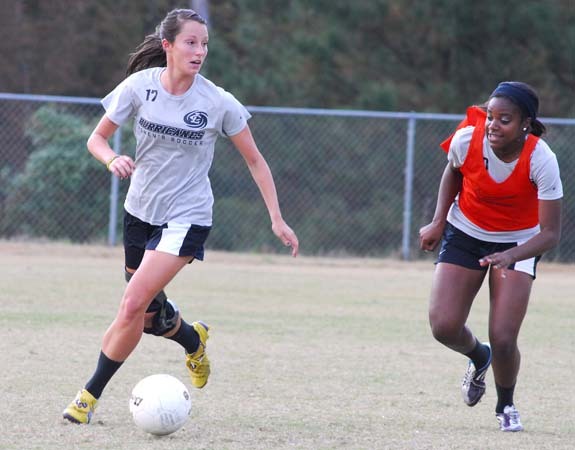 Samantha Parrish (left) has enjoyed an outstanding career for the LC women’s soccer team. LOUISBURG -- Louisburg College saved its best for last in 2012, winning the region and district championships en route to making its first-ever national tournament appearance. Veteran skipper Andy Stokes would love to relive that scenario this time around as LC heads to Lancaster, S.C., this weekend to take part in the Region X Tournament. 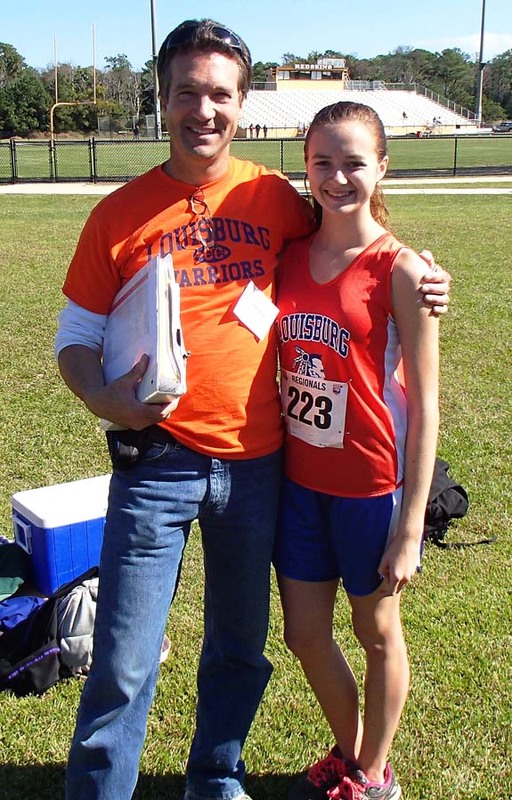 FRANKLIN COUNTY -- Not since the Tria Metzler days in the mid-2000s have the Bunn Ladycats sent a team to compete in the Class 2-A Girls Cross Country State Championships. 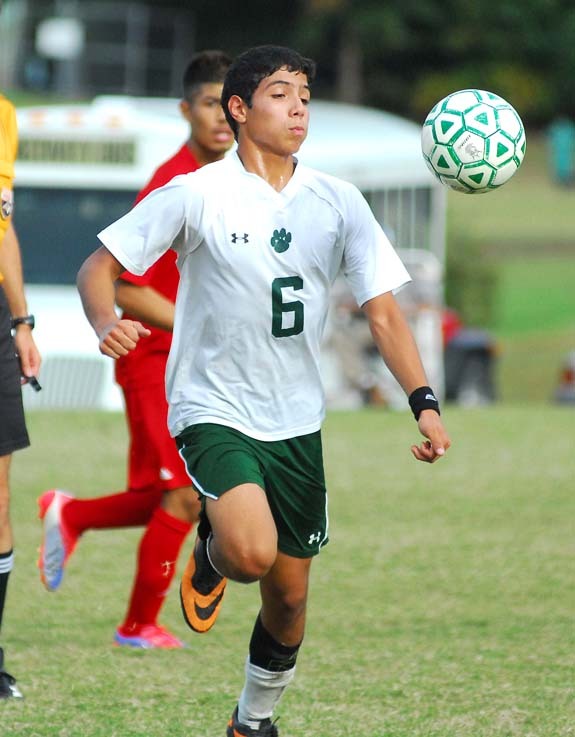 But Bunn will be making that elusive journey this time around after placing fourth at last Saturday’s Class 2-A Mideast Regional at WakeMed Soccer Park in Cary. HENDERSON -- The Vance-Granville Community College Vanguards men’s basketball team is scheduled to play 26 games during the 2013-2014 season, including 11 home games. 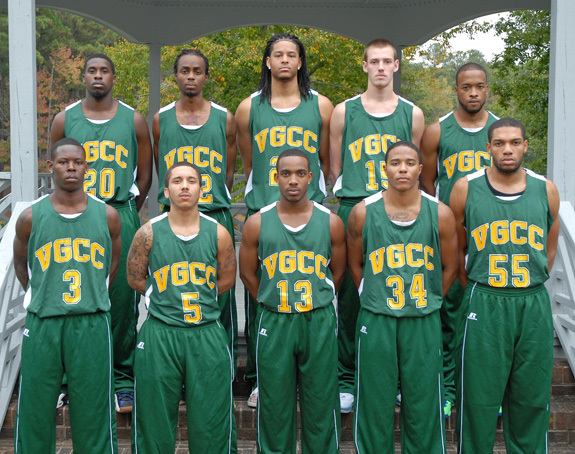 This is the program’s first season under the leadership of new VGCC head coach Michael Woody. 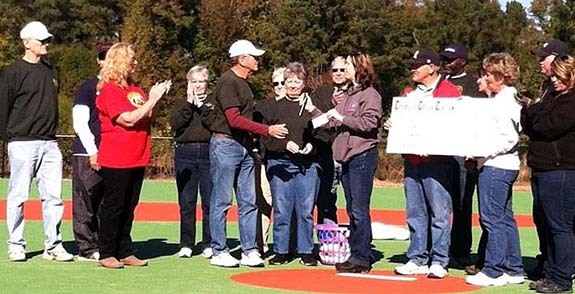 The Cypress Creek Civitan Club made a donation to the Miracle League of Franklin County last Saturday at the new Miracle League Field on Long Mill Road in Youngsville. Cypress Creek Civitan Club has been an integral part of the Miracle League almost since its inception. Donna Wade, Executive Director of the Miracle League, is a Cypress Creek member. 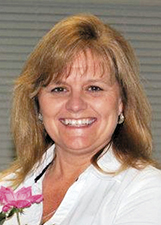 Kathy Kirby, the club president, serves on the Miracle League Board of Directors. YOUNGSVILLE -- The Youngsville Parks and Recreation Department is currently accepting basketball signups for boys and girls ages 5-12. Registration will end Saturday with a session from 8-11 a.m. at Luddy Park. For more information, call (919) 556-5073, (919) 496-9549 or visit www.youngsvilleparksandrec.com. CREEDMOOR -- It’s official -- the Northern Carolina Conference football standings are currently a jumbled mess at the top. Four teams are tied atop the NCC after last Friday’s action, which included South Granville’s 28-21 home victory over Bunn. MONTGOMERY, ALA. -- Freshman Malik Adams hauled in a program-record three touchdown receptions last Saturday, but it would not be enough as his North Carolina Wesleyan College Battling Bishop football team dropped a 59-35 decision at Huntingdon College. In the first half, the Hawks (5-2, 3-1 USA South) opened up a quick 14-0 lead before Wesleyan cracked the scoreboard with a 40-yard TD pass from senior Greg Edwards to Adams on a trick play midway the first quarter. RALEIGH -- The 38th edition of the North Carolina High School Athletic Association state volleyball championships is slated for Saturday at historic Reynolds Coliseum on the North Carolina State University campus. 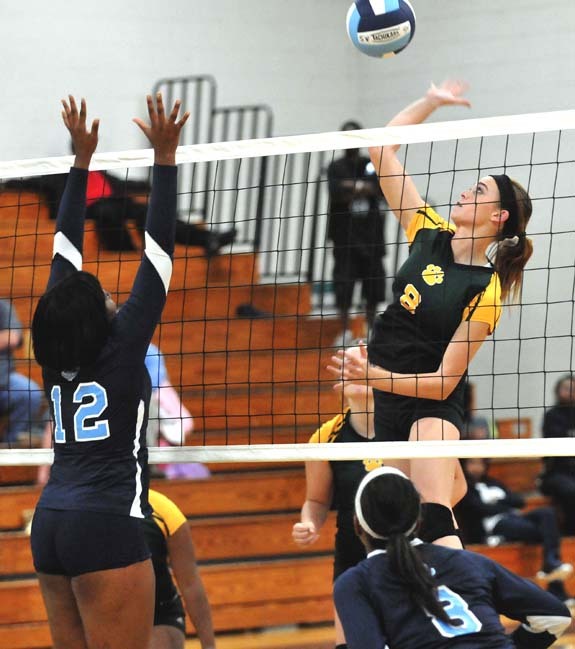 These finals have a very interesting field of teams, including five who are repeat visitors to the championship match and three making their debut in the NCHSAA volleyball finals. 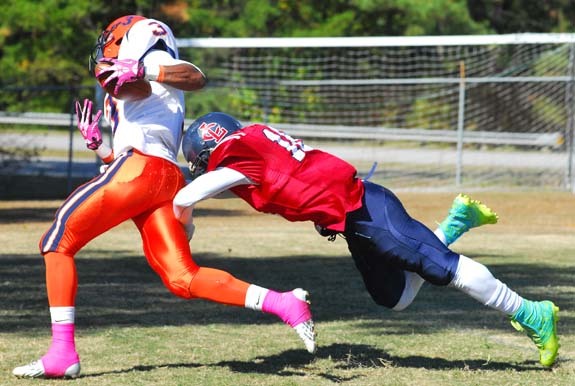 Louisburg College defensive back Darshaun Ford (right) makes a diving attempt but can’t prevent Nassau’s Antwane Grant from scoring a touchdown. Louisburg quarterback Caleb Allen picks up a first down off a bootleg during the Warriors’ home victory last Friday night over Granville Central. 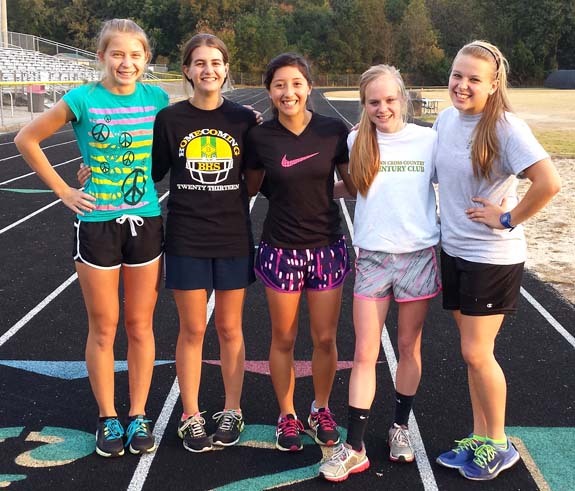 Bunn High School’s girls cross country squad qualified as a team for the Class 2-A State Championships, which will be held this Saturday at Beeson Park in Kernersville (located between Greensboro and Winston-Salem). Pictured are athletes (l to r) Madison Ferrara, Allison Fisk, Jhovanna Salmeron, Haley Sheehan and Ally Caldwell. 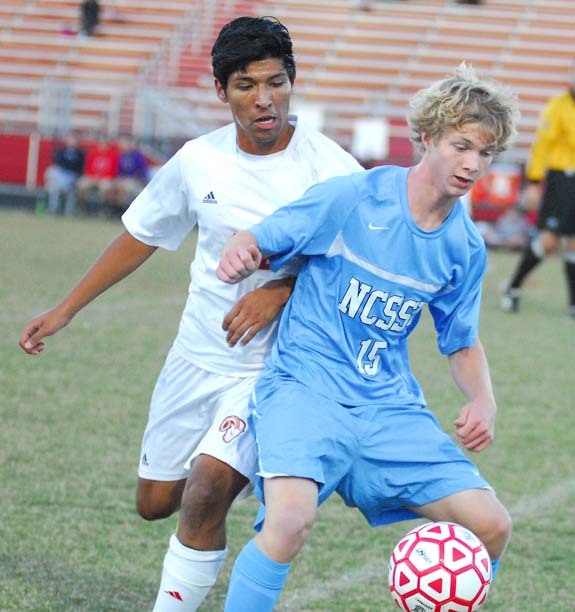 North Carolina School of Science and Math defender Vinay Kshirsager (left) heads the ball away for the Unicorns during last Wednesday’s road decision over rival Franklinton. Franklinton High School’s Aldo Rebollar (right) tries to come up with a steal during last Wednesday evening’s home soccer match with NC School of Science and Math. 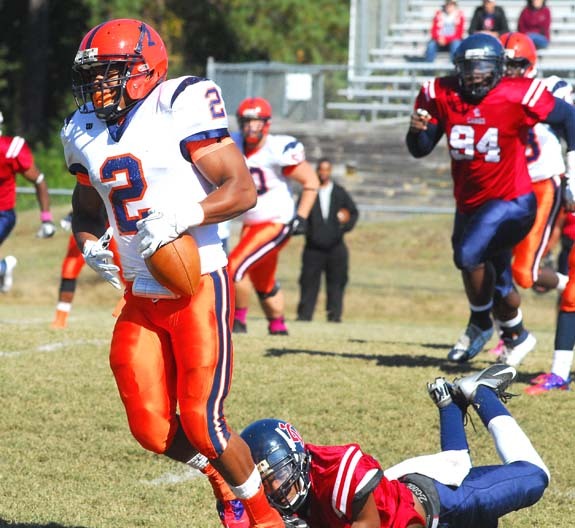 Louisburg College running back R.J. Washington seeks a lane during last Saturday afternoon’s home conference football game against Nassau CC at Franklinton Middle School. 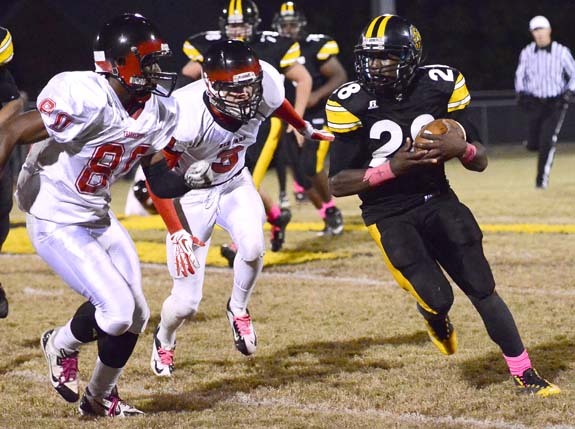 Franklinton standout running back Travon Judkins scoots for more yardage last Friday night against Roanoke Rapids. Do you have bare spots in your yard? Have you ever noticed the bare spots along the sides of highways and around shopping centers? I call these areas of poor soil ‘sorry soil,’ because they are sorry examples of what good soils should look like. A sheriff’s corporal and volunteer firefighter escaped serious injury following a single-vehicle wreck Tuesday morning. According to a report by Louisburg Officer Ian Battle, Ryan Hendrix was driving his personal vehicle, a Ford F-150 pickup truck, on West River Road at about 5:40 a.m. when he approached a curve. 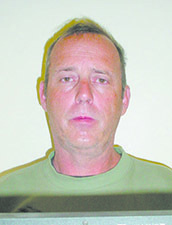 Hendrix told authorities that he swerved to miss four or five deer, causing him to run off the road. Maxim Healthcare will be giving flu shots at the Franklinton Senior Center on Tuesday, Nov. 5, from 9 a.m. to 12 p.m. and at the Louisburg Senior Center on Thursday, Nov. 7, from 9 a.m. to 12 p.m. Please bring your insurance information or be prepared to pay $30. LOUISBURG — Even though one Louisburg town leader opted not to seek re-election, it won’t keep town voters from having a decision on Nov. 5. Fred Hight Jr. is not running for office again, but Incumbents Joe Shearin and Boyd Sturges have filed, facing off against two political newcomers, Tom Clancy and Pat Walker — leaving four people to vie for three seats. YOUNGSVILLE — Youngsville voters will have the most opportunities to effect change in leadership. Mayor Sam Hardwick is not seeking re-election. Neither are two board stalwarts, Leelan Woodlief and Marvin Roberts. Their decisions leave a gap in the agenda-setting mayor position, with Deborah Palmer and Fonzie Flowers vying for the seat. FRANKLINTON — The town board of commissioner’s race would make a NASCAR fan proud — It’s four wide as four people are seeking three slots. 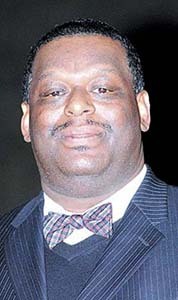 Incumbents John Allers, Al Barbour and Art Wright all filed for re-election and are facing a challenge from former police lieutenant and downtown businessman Johnny Wayne Mitchell. Franklin County sheriff’s deputies are looking for suspects involved in a shooting at a house party. Deputies responded to a call of shots being fired at a residence on Cambridge Drive near Franklinton the evening of Oct. 26. There was a crowd of people on scene when officers arrived, according to the report by Sgt. A.R. Roberts. Franklin County sheriff’s deputies are looking for suspects in an armed robbery set up by an attempted Craigslist purchase. Steven Abernathy reported the afternoon of Oct. 27 that he had arranged to buy some stereo equipment from someone on the Internet flee market site, meeting at the R & R Food Mart on Brantleytown Road. FESTI-FUN. 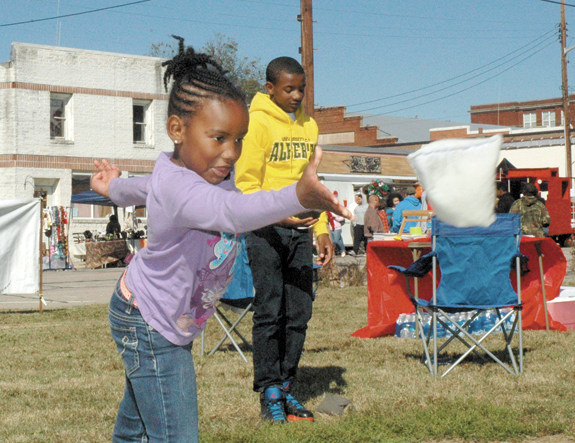 Asia Davis, foreground, and Quaseen Davis try their talents at a bean bag toss game set up on the grounds of Frankenfest on Main, a Franklinton street festival held this past Saturday. FESTI-FUN. 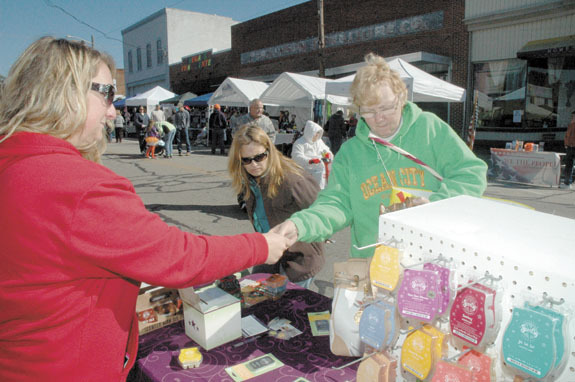 Roxy Dickinson, right, finds just what she’s looking for from the Scentsy booth set up at the street festival, as Melissa Mensing, background, also shops at the booth run by Kristen Bobbitt, left. Sheriff’s deputies are investigating an armed robbery. Hoyle Guy reported the morning of Oct. 26 that he was robbed at gunpoint while in the parking lot of Floyd’s Grocery on N.C. 98. According to the report by Dep. B. Lester, Guy said a cell phone, pocket knife and food stamps card were stolen. Give to kids? That’s exactly the plan! The food donation drive by the Early College High School Community Service Club will take place on Friday, Nov. 1, from 11 a.m. until 2 p.m. in the Walmart parking lot. A previous story incorrectly listed the date of the event, which is part of the United Way of Franklin County’s Feeding Franklin Fall Food Drive. The Franklin Times regrets the error. YOUNGSVILLE — More than three years ago, organizers of a baseball program for children with physical and mental challenges sought to make their field of dreams a reality. This Saturday, they will cut the ribbon on the Miracle League baseball field at Long Mill Elementary School. Donna Wade, the force behind the effort, said it would have never gotten done without the help of Assistant Superintendent Tommy Piper and county economic development staff Ronnie Goswick and Richie Duncan.